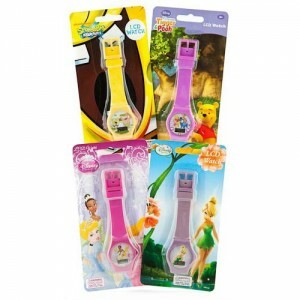 8 Styles of Disney Kids Watches $5 ea Shipped! Check out these 8 different Disney Kids LCD Digital Watches for just $5 each with free shipping! Your choice of Mickey Mouse, Pixar Cars, Spider Man, Tinkerbell pink, Tinkerbell purple, Toy Story blue, Toy Story brown and Winnie the Pooh. These retail for $19.95 each, so this deal is 75% off! Free expedited shipping will get them to you in time for Christmas!